Get a deeper, more restful sleep all through the night. Wake up feeling renewed and energized! Motivational Hypnotherapy's Joel Thielke and Catherine Perry have teamed up to create a powerful program that works with your REM cycle to help you sleep the whole night through so that you wake up feeling less groggy, more rested, and ready to take on your day. 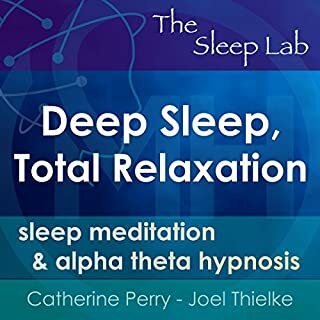 This Sleep Lab alpha theta hypnosis program helps you relax your mind and body for sleep while working with your brainwaves to help you create beliefs for positive change, joy, and positive thinking. I had a relaxation tape many years ago that I used in college that worked very well. This is not comparable to that program. Here is what you get: A woman in a flat monotone voice telling you to visualize a staircase while she counts down steps. The same flat voice telling you to visualize a path while she counts again. The same flat voice ( surprise!) while she counts down from three repeatedly. While this is going on in the background you are treated to “ planetarium” music . I tried to use this nightly. The first night it took me 1hour and 28 min to fall asleep. Then I woke up later to that “ planetarium “ music still playing. I have used it for several nights and while I have occasionally gotten to sleep in an hour I find myself loath to use it because I find it so annoying. There are a few times where the “ voice” tell you to “ notice how good your shoulders feel” and “take a deep breath” , the reference is often “ go deeper” into relaxation without teaching you how or leading you through to that point. Somewhere there should be relaxation materials that actually take you through HOW to relax yourself with steps you can easily use on your own. I did not find this to be that type of program. I also found it so annoying as to make it something to avoid. Here’s a tip from someone who often finds it hard to shut off their brain and fall asleep; turn on a good Audible novel you have read or listened to repeatedly so much so that you won’t be so interested in every word that you can’t stop paying attention to every detail. Remember when you were given a bedtime story as a child? You want one that won’t hold your attention to the point you can’t let go of it but you also want to feel comfortable and engaged. I found this technique much more helpful than this program. Sweet dreams. 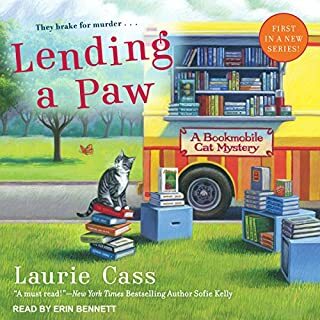 I have read all the Bookmobile Cat Mysteries and am thrilled that they are now available on Audible! It’s wonderful when the narrator’s voice matches the one that as a reader, you have heard in your head. I enjoy listening to books I have already read and will be downloading the rest of the series as it becomes available . The characters are likable, the setting charming and the mysteries intriguing. As for Eddie, he is so well written that anyone who has interacted with a cat will recognize his behavior. He is adorable and Minnie the librarian is very clever and funny. I look forward to spending more time with both of them! 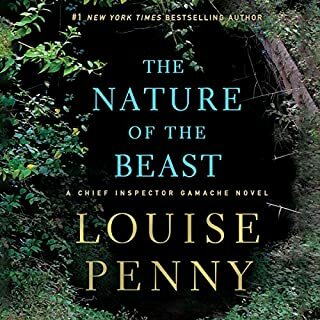 I have every Inspector Gamache Audible production. I also have read every book before I listen to the audio production. In this case I am so glad I do so as I am not sure I would have bought this book had I not. The book is wonderful, the audio production is not. Replacing Ralph Cosham would be a very difficult task. However, this is awful. The accent is so overly British it has no Canadian flavor. The voice is too high. The characters all sound as if I am listening to A Christmas Carol. I hope they will consider other narrators. I doubt I will order any more as this ruins a wonderful story. The Sweetheart Sisters, a trio of sassy, well-meaning grannies (who aren't against a sip of bourbon with breakfast), are ready to dispense advice and help create happy endings with a little of what they do best-meddling. Animal therapist Olivia Linscott is the Sweetheart Sisters' first target. 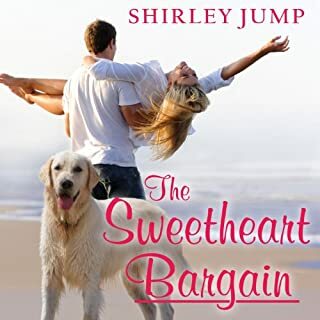 Running from a bad marriage and a lousy job, Olivia is determined to save the dog shelter she inherited from the mother she never knew and, above all, to protect her broken heart. Grumpy old men meet Grumpy old ladies! The narration was good. The most memorable and enjoyable characters were the elderly ladies. They provided the spark and interest that kept me listening to the story. The male dialogue was almost laughable in many spots and often tiresome and predictable in others, it was formulaic and off-putting. The adoption angle was intriguing and I would have liked that aspect of the story to be more developed and more resolved; it was much more interesting than the romance between the characters. I would consider buying another book in the series if the elderly ladies take center stage. Even though running Crewel World keeps Betsy plenty busy, a little extra cash on the side doesn't hurt. So when the local senior complex, Watered Silk, asks her to teach a class on the tricky punch needle technique, Betsy jumps at the opportunity to win over some new customers. 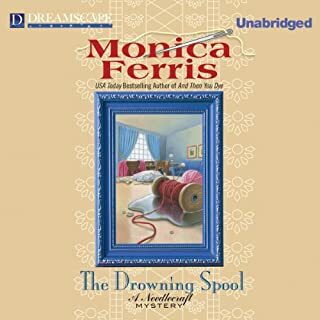 What disappointed you about The Drowning Spool? The narration was awful. Of all the Crewel World mysteries I have this was the poorest narration I have experienced. While Betsy's voice was good the other characters all had either whiney similar voices,or comical type accents whether male or female. Godwin's voice was terrible. Officer Jill Cross's voice, usually conveying calm and an authoritative air also had that strange nasal twang that almost all the female voices had. It was really distracting and I couldn't enjoy the story at all. Would you be willing to try another one of Betsy Bronson’s performances? I was disappointed in the narration. When providing the snippets to listen to the story before buying, please pick a section where more than one voice is used if at all possible. I listened to the snippet and Betsy's voice was good - but had I heard any of the others I would never have purchased this title.